After a hot shower and meal, I decided to take my mind off of it by doing my nails. And then I fell asleep, hence yesterday’s post. However, last week’s mani was starting to chip and look bad, so I made sure to get to it last night. I found me some good tv and got to work. I love the idea of the negative space mani, so I decided to try a different shape of stripe. 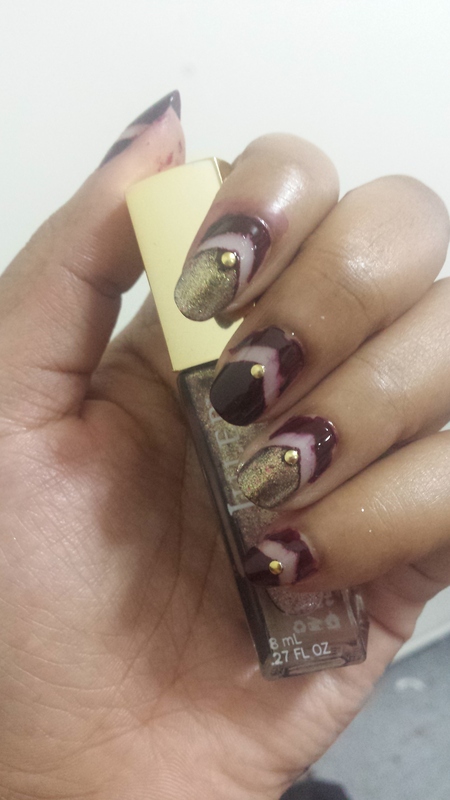 I went with a single chevron, and I took it to a deep, fall appropriate oxblood color. I don’t normally do super dark, but I’m trying to expand my horizons. Since the initial look felt too plain, I dressed it up with a bit of glittery polish and studs. The results? Next week is Comic Con. And I’m going all 4 days. Are you ready for the nail art coming your way?